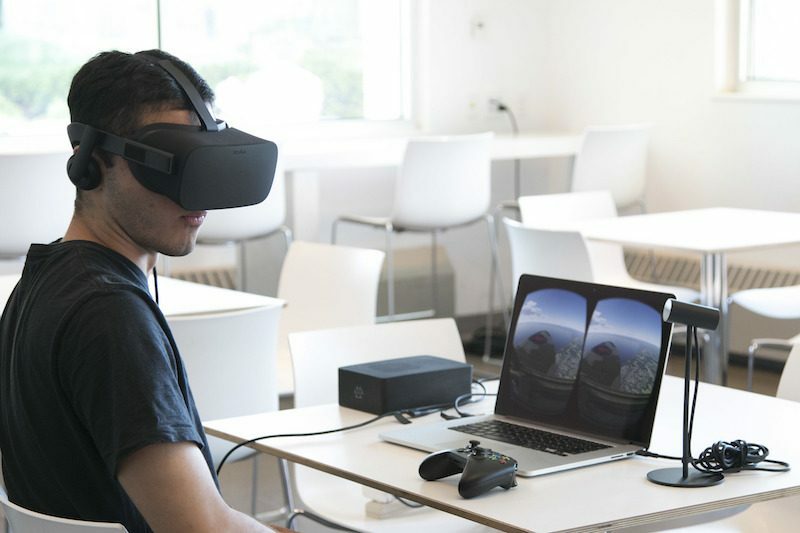 A Kickstarter project for a high-performance desktop GPU that can plug into a MacBook via Thunderbolt and is compatible with the Oculus Rift VR headset has raised its backing target of $50,000 in less than 24 hours. The Wolfe is a portable box that contains an Nvidia desktop-class graphics card and connects to a MacBook or other laptop via Thunderbolt 2 (or potentially Thunderbolt 3), and promises vastly improved performance for gaming, virtual reality, graphic design, and video editing. The team behind the Wolfe claims owners of newer laptops can expect performance increases up to 500 percent when using a Wolfe box, or up to 1000 percent with the Wolfe Pro, while older computers are said to see even more dramatic performance gains. What about NVIDIA's 10-series GPUs? As of right now, The Wolfe Pro includes an NVIDIA GTX 970. However, it's more than likely that Wolfe Pro level backers will be able to opt for the new GTX 1060 in our post-campaign survey for even better performance. The box runs off a 220W PSU and has three DisplayPort 1.2 connections, one HDMI 2.0 and one DVI-I port. The Thunderbolt connection also offers the potential for more than one Wolfe box to be used with one laptop, for building a render farm or for a multi-monitor setup, say the makers. Kickstarter early-bird pledges of $399 or more get backers a Wolfe box powered by a GTX 950 with the option of Thunderbolt 2 or 3 connectivity, while a standard pledge costs $449. An early-bird pledge for the Wolfe Pro is $549 ($599 for a standard pledge). A Wolfe DIY pack for modders who want to use their own GPU costs $269. The makers note that while the Wolfe will increase laptop display performance, the best results are expected to come with using an external monitor or VR headset, due to the inherent bandwidth restrictions in Thunderbolt 2. The project was conceived by a group of Harvard computer science graduates and Mac-owning gaming enthusiasts, after they hacked together a prototype GPU box in a DeWolfe dorm room at Harvard. The team has continued to improve the hardware and software at the Harvard Innovation Lab, with the aim of making Macs "performance powerhouses" and "to stop big companies from charging outrageous prices for minuscule upgrades" by letting users take control of their computer's performance. The Kickstarter project page quotes a shipping aim of February 2017. The project comes five months after Oculus Rift founder Palmer Luckey suggested VR headset support for the Mac was "up to Apple," and that the company needed to "prioritize higher-end GPUs." If Apple builds a machine that can handle the hardware, Oculus VR would "love to support Mac," said Luckey. Update September 23: The Wolfe team has canceled its Kickstarter campaign and refunded all pledges due to uncertainty over product certification. The team notes it remains committed to the project and is working with "new partners in the industry" to develop "an even better product." We've hoping for external GPUs for so long now; I remember when Thunderbolt first came out, that was one of the ideas MR readers were really excited about. A thin, light laptop with great battery life for portability - then just plug in an external GPU if you want to do high end gaming. Shame it never really materialised. I really hope Apple are considering this. They wouldn't even have to really do any work. Just release an SDK to allow this functionality on OS X and 3rd party graphics manufacturers can do the hard part of releasing the hardware. I know it would be massively popular. For all of you complaining about the choice of GPU: There is no GTX 1000 series driver support in macOS. These guys can't change that. It's why they are stuck with 900 series. I assume these dudes are running Bootcamp. VR software for macOS just doesn't exists. Gaming on macOS? Come on? Seems useful though but a little misleading, No? I think the idea is to encourage future support for macOS in these sectors. I'm confused, how is this different from existing thunderbolt pcie enclosures? With other boxes you can buy it and know it will ship to you. They lack the Vegas like thrill of throwing down money and maybe receiving a product or maybe getting a string of emails talking about how great it will be when you receive it after your tenth schedule delay in 2022. The enclosure seems quite small for a full size card. I wonder if they use MXM modules? Really? You're marketing to the Apple crowd with money and doing all this work on a external box, cabling, power and what have you and putting in a 950 series nvidia card? Wow. 1060 in the very least. OS X has no Pascal drivers yet so an enclosure with a 1060 would be an expensive paperweight at this point. "The PCIe (x16) slot accepts half-length, full-height, double-width cards and provides a maximum of 25W." The project comes five months after Oculus Rift founder Palmer Luckey suggested VR headset support for the Mac was "up to Apple ('https://www.macrumors.com/2016/03/03/oculus-rift-for-mac-requires-better-gpus/')," and that the company needed to "prioritize higher-end GPUs." If Apple builds a machine that can handle the hardware, Oculus VR would "love to support Mac," said Luckey. I love that burn he laid on Apple. Just freakin' awesome people like that call Apple out on their BS. Razer Core already does this. Chuck in any gpu you want and off you go. No Mac support and is stupidly expensive. Though is a dedicated eGPU that's getting good reviews. I hope these things get standardization and start pushing out to market. Been waiting for this potential. I'd love a future-gen 12" MacBook that's as small and light as ever, with sufficient CPU power for my needs (it's nearly there), and MASSIVE GPU power as-needed via an optional brick. Attach whatever display you like and enjoy your "desktop." Meanwhile a MacBoo Prok will do, and I'll rationalize lugging the weight by enjoying the larger screen. But I do LOVE those thin and light MacBooks! P.S. Thunderbolt 3 please. High-speed connections, USB, and video-out (even audio maybe) are FINALLY coming together in one connector. Let this painful transition happen as quickly as possible! I will gladly suffer through keeping adapters stuck on a few of my old cables for a year or two. TB1/TB2 doesn't really support eGPU 100% due to some issues for GFX cards, you have to jump through hoops abit to get it to work somewhat. TB3 added official support for eGPU.